World Peace gained a reputation as one of the league's premier defenders as he won the NBA Defensive Player of the Year Award in 2004, when he was also named an NBA All-Star and earned All-NBA honors. He was a participant in several controversial on-court incidents, most notably the Malice at the Palace, and is known for his sometimes eccentric and outspoken behavior. He won an NBA championship in 2010 as a member of the Los Angeles Lakers. Metta World Peace was born Ronald William Artest Jr. on November 13, 1979, and raised in the Queensbridge projects in Long Island City, Queens, New York. He has two younger brothers, Isaiah and Daniel. He played high school basketball at La Salle Academy. He also teamed with future NBA players Elton Brand and Lamar Odom on the same Amateur Athletic Union (AAU) team. Growing up, Artest witnessed the murder of a fellow player on a basketball court in Niagara Falls, New York. "It was so competitive, they broke a leg from a table and they threw it, it went right through his heart and he died right on the court. So I'm accustomed to playing basketball really rough." The player to whom Artest was referring was 19-year-old Lloyd Newton, who was stabbed in the back with a broken-off table leg during an altercation at a 1991 YMCA-sanctioned basketball tournament. Artest played college basketball at St. John's University from 1997 to 1999. At St. John's, he majored in mathematics. In 1999, he led the Red Storm to a 14-4 record in the Big East Conference and 28-9 overall and the Elite Eight of the NCAA Division I Tournament, losing to Ohio State. Artest gained fame playing in some of New York City's high-profile summer basketball tournaments at Nike Pro City, Hoops in the Sun at Orchard Beach, Bronx, New York and Dyckman Park at Washington Heights, earning himself nicknames such as Tru Warier and The New World Order, a name he received from Randy Cruz (one of the co-founders of the Hoops In The Sun basketball league at Orchard Beach). Artest played a total of 175 games for the Bulls over 2-1/2 years, the bulk as a starter, during which time he averaged about 12.5 points and just over 4 rebounds per game. He was named to the NBA All-Rookie Second Team in the 1999–2000 season. Midway through the 2001–02 season, Artest was traded by Chicago to the Indiana Pacers along with Ron Mercer, Brad Miller, and Kevin Ollie, in exchange for Jalen Rose, Travis Best, Norman Richardson, and a 2nd round draft pick. During the 2003–04 season with the Pacers, he averaged 18.3 points per game, 5.7 rebounds per game, and 3.7 assists per game. Artest made the 2004 NBA All-Star Game as a reserve and was named the Defensive Player of the Year. He wore three jersey numbers for the Pacers: 15, 23, and 91. On November 19, 2004, Artest was at the center of an altercation among players and fans during a game in Auburn Hills, Michigan, between Artest's Pacers and the home team Detroit Pistons. The brawl involved Artest, Pistons center Ben Wallace, Artest's teammates Jermaine O'Neal and Stephen Jackson, several other players, and spectators including Pistons fans John Green and A.J. Shackleford. The fight resulted in the game being stopped with less than a minute remaining. O'Neal, Jackson and Wallace were suspended indefinitely the day after the game. A day later, the NBA suspended Artest for the rest of the regular season, plus any playoff games. Artest missed 86 games, the longest suspension for an on-court incident in NBA history. Early in the 2005–06 season, Artest requested a trade from the Indiana Pacers and was put on the team's inactive roster. Artest's call for a trade created a rift between him and his teammates. "We felt betrayed, a little disrespected", teammate Jermaine O'Neal said. As for their basketball relationship, O'Neal said: "The business relationship is over. That's fact." Pacers president Larry Bird said he also felt "betrayed" and "disappointed". Though traded midseason to the Kings franchise, Artest quickly found his place on the team by providing some much needed defense. Though many[who?] feared his abrasive personality would be a problem, he worked well with his teammates and then-coach Rick Adelman. Artest wore #93 for his jersey number with the Kings. After acquiring Artest in late January 2006, the team immediately went on a 14–5 run, the team's best run of the season. The Kings broke .500 and landed the eighth spot in the Western Conference. This prompted ESPN to declare that "Ron Artest has breathed new life in the Sacramento Kings and enhanced their chances of reaching the playoffs for the ninth straight year." Fox Sports proclaimed, "Artest has Kings back in playoff hunt." Artest and Yao later exchanged extensive phone calls. Artest also said, "Whatever Adelman needs me to do, whether that's come off the bench, sixth, seventh man, start, I don't even care. Whatever he needs me to do, I'm 100 percent sure it's going to work out." 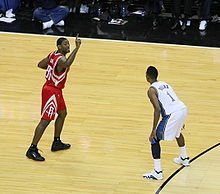 On October 30, 2008, Artest received his first technical as a Houston Rocket, as he raced towards a group of Dallas Mavericks players and then quickly went to Yao Ming who bumped Josh Howard after play stopped. Artest was trying to pull Yao away from the play and to the foul line, but contact was made with Maverick players. 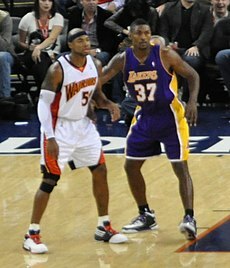 The TNT broadcast crew felt this technical was not warranted, and was based upon Artest's prior reputation as a feisty player in the league. In the playoffs, Artest helped the Rockets advance past the first round for the first time in 12 seasons. In Game 2 of the second round against the Los Angeles Lakers, Artest, who was battling for rebounding position with Kobe Bryant, was elbowed in the neck by Bryant, which was later ruled to be a Type 1 flagrant foul. After being called for an offensive foul, Artest was indignant and proceeded to antagonize Bryant after the play, which eventually led to an ejection by Joe Crawford. In Game 3, Artest was again ejected in the fourth quarter after a hard foul on Pau Gasol, who was attempting to dunk on a fast-break. It was determined the next day that the foul was not serious enough to warrant an ejection, and the flagrant foul was downgraded. In July 2009, the Los Angeles Lakers signed Artest to a five-year deal worth about $33 million. Artest chose the number 37 jersey, which he said was in honor of Michael Jackson. Jackson's Thriller album was at No. 1 on the charts for 37 straight weeks. In Game 5 of the 2010 Western Conference Finals, Artest hit a game-winning shot at the buzzer after grabbing a last second offensive rebound. He scored 25 points against the Phoenix Suns in Game 6 and went to the NBA Finals for the first time in his career. In the finals, the Lakers defeated the Boston Celtics, four games to three. Artest scored 20 points in the clincher and sank the team's last field goal – a three-pointer late in the fourth quarter – to virtually seal the victory. Afterwards, Lakers head coach Phil Jackson called Artest the most valuable player of Game 7 against the Celtics. He won his first championship ring with the Lakers. For the 2010–2011 season, Artest switched back to number 15, his college number at St. John's and the first number he wore in his NBA career. On April 26, 2011, Artest won the NBA's J. Walter Kennedy Citizenship Award. Artest changed his name to Metta World Peace during the offseason. He came into training camp for the 2011–12 season out of shape. Consequently, new Lakers coach Mike Brown moved World Peace to a reserve role with reduced playing time. World Peace lamented that Brown's coaching style placed too much emphasis on statistics. World Peace and Laker Pau Gasol against Washington's JaVale McGee in 2012. On April 22, 2012, in a game against the Oklahoma City Thunder, World Peace elbowed James Harden in the head as he was celebrating a dunk. He received a flagrant foul 2 and was immediately ejected. Harden stayed on the floor for several minutes and left the game for evaluation. Harden was later found to have suffered a concussion. After the game, World Peace apologized in front of reporters, stating that the elbow was "unintentional." On April 24, 2012, World Peace was suspended for seven games, meaning he would miss the Lakers' season finale game against the Sacramento Kings as well as the first few games of the playoffs. After a 1–4 start to the 2012–13 season, the Lakers fired Brown as head coach and hired Mike D'Antoni. On December 18, 2012, in a win against the Philadelphia 76ers, he grabbed a career high 16 rebounds to add to his 19 points. On January 11, 2013, he suffered a right leg injury against the Thunder that would hamper him for two months. Around the same time, he also had an injury to his right arm that made it difficult to bend. His health worsened to the point where D'Antoni moved him off the perimeter on defense and had him guard power forwards instead. By mid-March, he was able to guard the perimeter again. On March 25, against the Golden State Warriors, World Peace tore the lateral meniscus in his left knee. He underwent surgery that was originally estimated to sideline him for six weeks. Despite the estimates, he returned 12 days after his surgery. In his absence, D'Antoni was using a reduced seven-man rotation with Kobe Bryant playing close to all 48 minutes each game. World Peace wanted to reduce his teammates' workload, if even for a few minutes, as the Lakers fought to qualify for the playoffs. The Lakers qualified for the playoffs as the seventh seed, but were swept 4–0 by San Antonio in the first round. 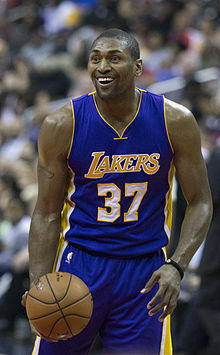 Due to the Lakers' other injuries, World Peace played in Game 3 in spite of running with discomfort after having fluid drained from a cyst behind his surgically repaired left knee. He missed the final game of the series, and later admitted he came back too soon. For the season, he averaged his most points (12.4) since 2008–09, and shot his highest percentage (.404) since 2009–10. Still, ESPN wrote those numbers indicated that "the 33-year-old is clearly on the decline". On July 11, 2013, after four seasons with the Lakers, the team waived World Peace via the amnesty clause to gain relief from the salary cap. On July 16, 2013, World Peace signed a two-year deal with the New York Knicks. On February 24, 2014, he was waived by the Knicks after they bought out his contract. On August 4, 2014, World Peace signed with the Sichuan Blue Whales of the Chinese Basketball Association. Due to a recurrent knee injury, he was replaced on the roster in December 2014 with Daniel Orton. In 15 games, World Peace averaged 19 points, 6 rebounds and 2.3 steals per game. On March 24, 2015, World Peace signed with Pallacanestro Cantù of Italy for the rest of the 2014–15 Lega Basket Serie A season. On May 27, 2015, in Cantù's Game 5 quarter-final loss to Reyer Venezia Mestre which ended their season, World Peace was ejected from the game and charged with five fouls after getting involved in a skirmish during the fourth quarter. In July 2015, he parted ways with the club after the two parties could not come to a new contract agreement. On September 24, 2015, World Peace signed with the Los Angeles Lakers, returning to the franchise for a second stint. On November 6, 2015, he made his season debut in a 104–98 win over the Brooklyn Nets, playing 17 minutes with a plus-minus of 12. Teammate Kobe Bryant praised him for his impact on "everybody on the floor defensively". On September 21, 2016, World Peace re-signed with the Lakers. On April 11, 2017, World Peace scored a team-leading 18 points in the second half to help the Lakers extend its longest winning streak in four years to five games with a 108–96 victory over the New Orleans Pelicans. He had the ball in his hands with the crowd on its feet for the Lakers' final possession in what was potentially his final game at Staples Center. During the game, he got his 1,716th and 1,717th career steals to move past Ron Harper for 22nd place in NBA history. During the offseason, World Peace played with the New Orleans Gators of the Global Mixed Gender Basketball (GMGB) League. On October 23, 2017, World Peace was hired as a player development coach by the South Bay Lakers, the Los Angeles Lakers' development-league team in the NBA G League. During the offseason in 2018, he played 3x3 basketball with the BIG3. He played under the name Ron Artest at the request of league co-founder Ice Cube, who wanted to "turn back the clock a little bit". Artest celebrates at the 2010 Lakers Championship parade. On December 18, 2010, an art show honoring Artest was held in Toronto, Canada. Entitled Lovable Badass, the show featured work by 30 Canadian and American artists, illustrators, painters and sculptors inspired by the athlete. Artest made a surprise appearance at the exhibition's opening night, commenting that "(the show) was definitely special. It was unexpected. Overwhelming." 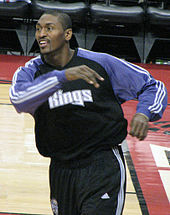 Artest was part of the line-up for the thirteenth season of the reality show Dancing with the Stars, though he finished in last place, being eliminated in the show's first week. In October 2012, he appeared as a panelist on Nickelodeon's game show Figure It Out.In September 2013, he made the first in a recurring series of skits on the Comedy Central sketch show Key and Peele called "Metta World News", in which he plays a newscaster. Peace competed against actor Skylar Astin in an episode of Spike's Lip Sync Battle that aired June 21, 2017. He performed Cypress Hill's "Insane in the Brain" and Katy Perry's "Roar" but did not win. In January 2018, it was announced that World Peace was a contestant in the first U.S. edition of Celebrity Big Brother. Metta became the fourth celebrity to be evicted from the house on Day 20. He also appeared in the second season as part of a Head of Household competition. World Peace is the founder of the Artest Media Group. Established in 2010, the brand management company's clients include himself and music artists Vinita, Deacon, Sade Artest, Rugby, and Emmaline Cleary. Music producers Wip, Q, and Lucky are also associated with the group. On February 19, 2013, World Peace was awoken by a squad of police who received a tip there had been gun play within his property. Authorities were quick to recognize their mistake after World Peace explained that the armed individuals were actors shooting a "life on the streets"-styled movie for his group. On October 31, 2006, Artest released a rap album entitled My World. He published the album on the Lightyear Records label under his own imprint, Tru Warier Records. The album features guest artists P. Diddy, Juvenile, Mike Jones, Big Kap, Nature and Capone. He has become involved in advocacy relating to mental health issues. In December 2010, he announced that he would donate some or all of his salary for the 2011–12 NBA season toward mental health awareness charities. Artest also auctioned off his 2009–10 championship ring and donated the proceeds to various mental health charities nationwide. In 2016, he told Sports Illustrated, "Some people don’t understand mental health is broad. You have to ask questions. Are you depressed? Are you schizophrenic? Do you have anxiety? Are you bipolar? Those are the different things that come under the banner of mental health." He has posed for PETA ad campaigns encouraging people to report animal abuse and to have their pets fixed. During his rookie season in Chicago, he was criticized for applying for a job at Circuit City in order to get an employee discount. In a December 2009 Sporting News interview, Artest admitted that he had led a "wild" lifestyle as a young player, and that he drank Hennessy cognac in the locker room at halftime while with the Bulls. In February 2004, he wore a bathrobe over his practice uniform to a Pacers practice as "a symbolic reminder to take it easy". Artest was suspended for three games in 2003 for destroying a TV camera at Madison Square Garden, and for four games the same year for a confrontation with Miami Heat coach Pat Riley. He was also suspended for two games early in the 2004–05 season by Pacers head coach Rick Carlisle after he allegedly asked for a month off because he was tired from promoting an R&B album for the group Allure on his Tru Warier production label, on which he released his own album, a rap recording titled My World, in October 2006. The brawl began when Artest fouled Pistons center Ben Wallace as Wallace was putting up a shot. Wallace, upset at being fouled hard when the game was effectively over (the Pacers led 97–82 with less than 50 seconds to go), responded by shoving Artest, leading to an altercation near the scorer's table. Artest walked to the sideline and lay down on the scorer's table. Reacting to Wallace throwing something at Artest, Pistons fan John Green threw a cup of Diet Coke at Artest, hitting him. Artest jumped into the front-row seats and confronted a man he incorrectly believed to be responsible, which in turn erupted into a brawl between Pistons fans and several of the Pacers. Artest returned to the basketball court, and punched Pistons fan A.J. Shackleford, who was apparently taunting Artest verbally. This fight resulted in the game being stopped with less than a minute remaining. Artest's teammates Jermaine O'Neal and Stephen Jackson were suspended indefinitely the day after the game, along with Wallace. On November 21, the NBA suspended Artest for the rest of the regular season, plus any playoff games. All told, Artest missed 86 games (73 regular season games plus 13 playoff games), the longest suspension for an on-court incident in NBA history. Eight other players (four Pacers and four Pistons) received suspensions, without pay, which ranged from one to thirty games in length. Each of the players involved were levied fines and ordered to do community service. Several fans were also charged and were banned from attending Pistons games for life. Artest lost approximately $5 million in salary due to the suspension. On March 5, 2007, Artest was arrested for domestic violence, and excused from the Sacramento Kings indefinitely by GM Geoff Petrie. On March 10, Kings announced that Artest would return to the team, while his case was being reviewed by the Placer County District Attorney. On May 3, he was sentenced to 20 days in jail and community service. Artest spent only 10 days in the jail, as the judge stayed 10 days of the sentence, and served the remainder in a work release program. On July 14, 2007, the NBA suspended Artest for seven games at the beginning of the 2007–08 NBA season for his legal problems. On September 16, 2011, Artest's name was officially changed to Metta World Peace. "Metta" is his first name, and "World Peace" is his surname. "Changing my name was meant to inspire and bring youth together all around the world", World Peace said in a statement released after the name change court hearing. His publicist, Courtney Barnes, said that World Peace chose Metta as his first name because it is a traditional Buddhist word that means loving kindness and friendliness towards all. World Peace and Kimsha Artest (née Hatfield) were married for 6 years. Kimsha was a cast member on VH1's reality TV show Basketball Wives: LA. The two have three children together: Sadie, Ron III, and Diamond. Kimsha and World Peace, who was still named Ron Artest at the time, married in June 2003 and divorced in 2009. World Peace has another son, Jeron, with his former high school girlfriend Jennifer Palma. In the late 1990s, World Peace became a close friend of American-born Irish basketball legend, Jermaine Turner. The pair met on the playgrounds of New York and played together in tournaments at Rucker Park. ^ Aasen, Adam (February 10, 2005). "The man behind the melee". Indiana Daily Student. Archived from the original on December 9, 2013. Retrieved April 11, 2010. ^ a b "Ron Artest Bio Page". NBA.com. November 13, 1979. Retrieved December 29, 2010. ^ Player Dies in Stabbing at Basketball Game. Nytimes.com (April 15, 1991). Retrieved on April 27, 2012. ^ Ron Artest Pro and College Stats Archived September 27, 2007, at the Wayback Machine. Databasebasketball.com (November 13, 1979). Retrieved on April 27, 2012. ^ "Ron Artest". TruWarier.com. Retrieved December 29, 2010. ^ Tim Davenport, "A Ron Artest Review: The Soap Opera So Far", Silver Screen and Roll, July 4, 2009. ^ "Fan details strides made since brawl". ESPN.com. November 19, 2009. Retrieved November 19, 2009. ^ a b "Artest, Jackson charge Palace stands". ESPN.com. November 21, 2004. ^ "Suspensions without pay, won't be staggered". ESPN. November 22, 2004. Retrieved June 2, 2012. ^ 'Betrayed' Bird says Artest must go – December 27, 2005. MSNBC (December 27, 2005). Retrieved on April 27, 2012. ^ a b Kahn, Mike (March 14, 2006). "Artest has Kings back in playoff hunt". Fox Sports. Archived from the original on May 24, 2006. ^ NBA Preview – Lakers At Kings – March 14, 2006. Sports.espn.go.com (March 14, 2006). Retrieved on April 27, 2012. ^ Amick, Sam (July 9, 2006). "Q & A: Artest hits the road and the hardwood". The Sacramento Bee. p. C1. Archived from the original on May 12, 2008. ^ Rockets agree to send pick, Greene, Jackson to Kings for Artest. Sports.espn.go.com (July 31, 2008). Retrieved on April 27, 2012. ^ "It's official: Rockets acquire Ron Artest in blockbuster trade". NBA.com. Retrieved August 14, 2008. ^ Feigen, Jonathan (July 30, 2008). "Despite Yao's comments, Artest seems happy about future". Houston Chronicle. Retrieved August 14, 2008. ^ Feigen, Jonathan (August 15, 2008). "Rockets hoping Artest ends playoff drought". Houston Chronicle. Retrieved December 29, 2010. ^ "Rockets down Blazers, advance to second round for first time in 12 years". CBS Sports. May 1, 2009. Retrieved May 1, 2009. ^ Sheridan, Chris. League also looking at Celtics-Magic, May 7, 2009. Retrieved September 4, 2010. ^ "Artest not suspended for Game 4, foul downgraded". NBA.com. May 9, 2009. Retrieved December 29, 2010. ^ "Lakers officially sign Ron Artest". July 7, 2009. Archived from the original on July 11, 2009. Retrieved July 7, 2009. ^ "Aretest, Brown sign contracts". July 8, 2009. Retrieved July 8, 2009. ^ "Boston Celtics vs. Los Angeles Lakers – Box Score – June 17, 2010 – ESPN". ESPN. June 17, 2010. Retrieved July 7, 2010. ^ Dwyer, Kelly (June 18, 2010). "Lakers take Game 7, win back-to-back titles". yahoo.com. Archived from the original on February 21, 2011. ^ "Ron Artest switching to No. 15 Lakers jersey". ocregister. August 20, 2010. Archived from the original on August 22, 2010. Retrieved August 20, 2010. ^ McMenamin, Dave (January 26, 2012). "World Peace declining? Nah, just "bored"". ESPN.com. Archived from the original on February 14, 2012. ^ Berger, Ken (February 11, 2012). "Lakers, World Peace struggling to adjust to Brown and vice versa". CBSSports.com. Archived from the original on February 14, 2012. ^ McMenamin, Dave (April 22, 2012). "Metta World Peace ejected for elbow". ESPN.com. Retrieved April 22, 2012. ^ Mayberry, Darnell (April 22, 2012). "OKC Thunder: James Harden faces rigorous evaluation, uncertain return to court after concussion". NewsOK. Retrieved April 22, 2012. ^ Medina, Mark (April 22, 2012). "Metta World Peace apologizes for ejection, doesn't take questions". Los Angeles Times. Retrieved April 23, 2012. ^ "Metta World Peace suspended for 7". ESPN.com. April 24, 2012. Retrieved April 24, 2012. ^ a b McMenamin, Dave (March 17, 2013). "Metta World Peace feeling, playing better". ESPN.com. Archived from the original on April 12, 2013. ^ Pincus, Eric (March 26, 2013). "Metta World Peace out with torn meniscus in left knee". Los Angeles Times. Archived from the original on April 10, 2013. ^ Rohlin, Melissa (March 28, 2013). "Ready for surgery, Metta World Peace tweets he's ready to play". Los Angeles Times. Archived from the original on April 10, 2013. ^ McMenamin, Dave (April 9, 2013). "Rapid Reaction: Lakers 104, Hornets 96". ESPN.com. Archived from the original on April 10, 2013. ^ McMenamin, Dave (April 9, 2013). "Metta World Peace details his recovery". ESPN.com. Archived from the original on April 10, 2013. ^ "Dwight Howard ejected as Spurs finish sweep of Lakers". ESPN.com. Associated Press. April 28, 2013. Archived from the original on April 29, 2013. ^ "Spurs send Lakers to worst home playoff loss, brink of elimination". ESPN.com. Associated Press. April 26, 2013. Archived from the original on April 28, 2013. ^ McMenamin, Dave (April 27, 2013). "Lakers depleted again for Game 4". NBA.com. Archived from the original on April 28, 2013. ^ a b McMenamin, Dave (May 6, 2013). "2012-13 Lakers Report Card: Starting five". ESPN.com. Archived from the original on May 7, 2013. ^ "Lakers Waive Metta World Peace Under Amnesty Provision". NBA.com. Turner Sports Interactive, Inc. July 11, 2013. Retrieved July 15, 2013. ^ "Metta World Peace eyes future". ESPN.com. July 9, 2013. Retrieved July 15, 2013. ^ "Knicks Sign Metta World Peace". NBA.com. Turner Sports Interactive, Inc. July 16, 2013. Archived from the original on July 18, 2013. Retrieved July 16, 2013. ^ "Knicks Waive Metta World Peace And Beno Udrih". NBA.com. Turner Sports Interactive, Inc. February 24, 2014. Archived from the original on March 3, 2014. Retrieved February 24, 2014. ^ "Knicks buy out Metta World Peace". ESPN.com. February 24, 2014. Retrieved February 24, 2014. ^ Ben Golliver. "Knicks release Metta World Peace, Beno Udrih". SI.com. Retrieved August 25, 2015. ^ "Metta World Peace officially signs with Sichuan Blue Whale". Sportando.com. August 4, 2014. Retrieved August 4, 2014. ^ "Daniel Orton joins CBA to replace Metta World Peace". Global Times. Xinhua. December 10, 2014. Archived from the original on December 13, 2014. ^ "Pallacanestro Cantù announces Metta World Peace". Sportando. March 24, 2015. Retrieved August 25, 2015. ^ "Metta World Peace, a.k.a. The Panda's Friend, was ejected from final game of Italian season – SportsNation – ESPN". ESPN.com. Archived from the original on July 22, 2015. Retrieved August 25, 2015. ^ "Metta World Peace won't return to Cantù, GM says". Sportando. July 20, 2015. Retrieved August 25, 2015. ^ "Lakers Sign Metta World Peace". NBA.com. September 24, 2015. Retrieved September 24, 2015. ^ "Bryant, Lakers beat winless Nets for 1st victory". NBA.com. November 6, 2015. Retrieved November 10, 2015. ^ a b Singh, Ramneet (November 8, 2015). "Kobe Bryant On Metta World Peace: 'Raises The Play Of Everybody On The Floor'". LakersNation.com. Retrieved November 10, 2015. ^ "Lakers Sign Metta World Peace". NBA.com. September 21, 2016. Retrieved September 23, 2016. ^ "THE NEW ORLEANS GATORS SIGN METTA WORLD PEACE FORMERLY KNOWN AS RON ARTEST". neworleansgators.com. August 25, 2017. Retrieved September 30, 2017. ^ "South Bay Lakers Hire Metta World Peace as Player Development Coach". NBA.com. October 23, 2017. Retrieved October 23, 2017. ^ Ganguli, Tania (October 23, 2017). "Metta World Peace rejoins Lakers organization in new role for fan favorite". LATimes.com. Retrieved October 23, 2017. ^ Peter, Josh (June 21, 2018). "Ron Artest is back: Metta World Peace turns back clock in BIG3 league". USA Today. ^ Vlessing, Etan (April 1, 2010). "Ron Artest to get own reality series". The Hollywood Reporter. Archived from the original on April 4, 2010. Retrieved April 5, 2010. ^ Lovable Badass: Artists on Artest. Lovablebadass.blogspot.com (December 28, 2010). Retrieved on April 27, 2012. ^ Feschuk, Dave (December 19, 2010). "Art show on Artest overwhelms the Lakers forward – Toronto Star, Canada". The Star. ^ a b Shelburne, Ramona (September 1, 2011). "Ron Artest talks name-change holdup". ESPNLosAngeles.com. Archived from the original on November 12, 2011. ^ Halterman, Alexandra (June 19, 2017). "Hear Metta World Peace 'Roar': Lakers Star Does His Best Katy Perry on 'Lip Sync Battle'". Billboard. Retrieved March 6, 2019. ^ Hearon, Sarah (January 28, 2018). "'Celebrity Big Brother' Cast Revealed". Us Weekly. Retrieved February 7, 2018. ^ "Outside Metta World Peace's home, real cops confront fake gunmen". Los Angeles Times. February 20, 2013. Retrieved February 22, 2013. ^ "Ron Artest speaks candidly about mental health – ESPN Los Angeles". sports.espn.go.com. Retrieved December 23, 2010. ^ "Los Angeles Lakers' Ron Artest to donate salary to mental health charity – ESPN Los Angeles". sports.espn.go.com. Retrieved December 23, 2010. ^ Lloyd, Jonathan (July 25, 2013). "Metta World Peace Returns to LA on PETA Billboard". nbclosangeles.com. "NBC4". Retrieved October 18, 2015. ^ Wilbon, Michael (January 26, 2006). "In Artest, Sacramento Gets A King-Size Nuisance". The Washington Post. p. E01. ^ a b c "Artest Timeline: Ron-Ron's troubled past". ESPN.com. March 22, 2007. ^ Greenberg, Steve (December 2, 2009). "SN Conversation with Ron Artest: 'I used to drink Hennessy at halftime'". sportingnews.com. Retrieved December 2, 2009. ^ "Artest aiming to be ready for playoffs". ESPN.com. February 23, 2004. ^ Alipour, Sam (October 4, 2006). "Road trippin' with Tru Wariers". ESPN Page 2. Retrieved October 31, 2014. ^ "Palace brawl lives in infamy 1 year later". MSNBC. November 26, 2005. Archived from the original on April 18, 2012. ^ "Kings suspend Artest after domestic violence arrest". ESPN.com. March 6, 2007. ^ Amick, Sam (March 10, 2007). "Kings reinstate teary-eyed Artest after two-game absence". The Sacramento Bee. ^ Watson, Matt (May 3, 2007). "Ron Artest Sentenced to 20 Days (He'll Likely Never Serve)" (FanHouse). AOL Sports Blog. ^ "Jackson, Artest suspended following court pleas". ESPN.com. Associated Press. July 15, 2007. Retrieved July 15, 2007. ^ a b Bolch, Ben (September 16, 2011). "We have World Peace: Ron Artest gets name change". Los Angeles Times. Retrieved October 5, 2011. ^ "Court approves Artest's name change to Metta World Peace". NBA.com. Associated Press. September 16, 2011. Archived from the original on March 14, 2014. Retrieved March 12, 2014. ^ Feigen, Jonathan (August 9, 2008). "Rockets forward Artest thrives on competitive nature". Houston Chronicle. Retrieved September 17, 2011. ^ "Ron Artest: I've Been Divorced for Years!". TMZ. July 25, 2011. Retrieved September 17, 2011. ^ Lieber, Jill (October 26, 2005). "Artest puts himself to the test". USA Today. Retrieved September 17, 2011. ^ "Artest Makes A Play For Custody Of His Son". NY Daily News. September 12, 2006. Retrieved September 17, 2011. ^ Shannon, Kieran (January 29, 2017). "The Kieran Shannon Interview: Superman Jermaine Turner still going strong". IrishExaminer.com. Retrieved July 5, 2017. Wikimedia Commons has media related to Metta World Peace.